Styal Golf Club members and officials are delighted with the nomination of their long-serving professional Mark Johnson (pictured) for the England Golf Coach of the Year award which will be decided in March at the Awards evening in London. Last year Styal were nominated for Club of The Year and just missed out as did Cheshire as County of the year. Cheshire did pick up one national award when Mottram Hall professional Matthew Turnock was awarded the Coach of the Year award and now Mark is looking to follow in his footsteps. He made an unusual start in golf for one who has gone so far in the game as he explained: “I was a late starter at golf, age 19, but quickly got completely hooked on the game. “I joined Styal as a member when it first opened in 1996 and stated work as the assistant pro (after leaving part way through my degree course in Architecture) when the range opened a few months later and I have been there ever since! 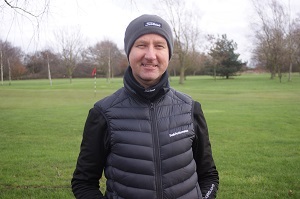 “I started coaching around 2000, like many assistants with the juniors, and coaching quickly became my focus and I have been a full time coach at Styal since I qualified with the PGA in 2002. “I went on to study all aspects of golf performance including physiology, and psychology, optimising learning and performance. I’m a bit of a techno and even in the early days used, video and computer software -now its high-speed cameras, 3D and launch monitors. “I have an on-going fascination with understanding all aspects of the golf swing and I am still constantly learning and striving to find ways to make my golfers play better and I’ve attended an endless amount of seminars and coaching conferences over the years. “I developed the Junior section at Styal with various programmes over the years and the real change came when I started coaching the Cheshire County Academy Programme in 2010 and with it I took on the role to develop our junior membership section at the club. “Key to its success was providing a friendly, educational and competitive environment for the juniors to thrive. “In 2018 I took on a Cheshire Girls coaching role as well as the Cheshire Boys coaching and had great fun with the new GolfSixes League (which Styal won) and the Girls Golf Rocks programme. “I also had great fun with England’s ‘Get into Golf’ Player Pathway for adult beginners. “I owe a big thanks you to Glynn, Simon and Richard and everyone at Styal GC for their continued support and opportunity and freedom to develop the junior section and my coaching career. “Styal is such a great club for so many players, beginners, ladies, families, seniors, golfers ofall abilities, casual golfers, elite players and of course for juniors.